Clear Acrylic Plastic FDA cutting boards butcher blocks. 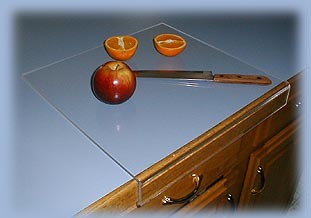 Our acrylic Cutting Boards are made of clear acrylic. This material is FDA approved for cutting food and vegetables. Please visit our links below for care and cleaning instructions. We have a wide range of sizes to choose from. For cutting small quantities to full counter tops for your home or restaurant. The clear acrylic is 1/4" thick, it has a 1" bend on one side that rests on the edge of your counter top and prevents sliding. 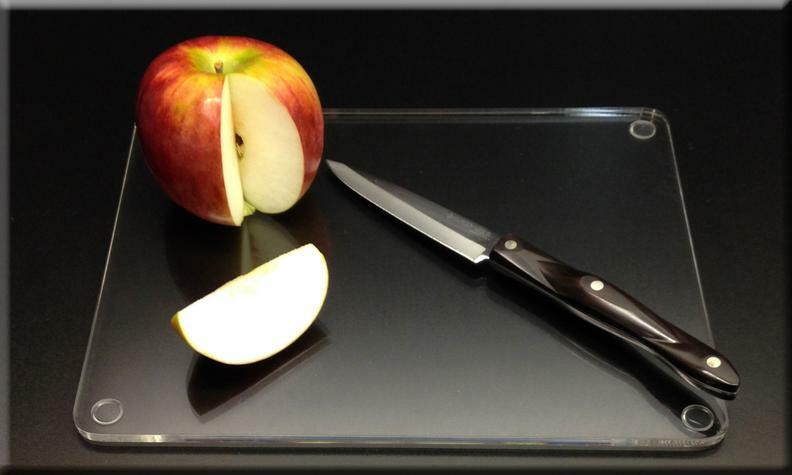 We can produce a custom counter top cutting board per customer's drawing or sketch. Just send a drawing to us by fax, E-mail, or to our address and we would be glad to quote any special cutting board. We take the time to radius and remove all sharp edges from our cutting boards. The cutting tolerance on all cutting boards is +/- 1/8"
This style cutting board has a 1" lip on one end that overhangs your counter top to keep from sliding around your cutting area. Comes complete with clear rubber tabs for the bottom to keep in place while cutting. We can also produce this style without the 1" lip. Need a custom cut to size cutting board? Click on the QUOTE FORM and we would be gald to quote you accordingly. Maximum shipping size is 28" x 32". All cutting boards come supplied with clear tabs for the bottoms to keep from shifting or sliding to keep saf while cutting.